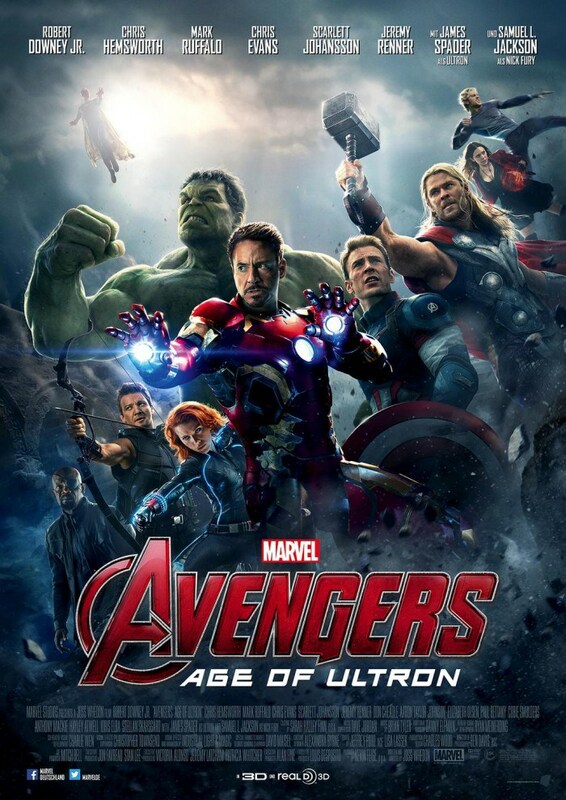 Age of Ultron is here! A couple of weeks ago I ran the Orange County 5K. 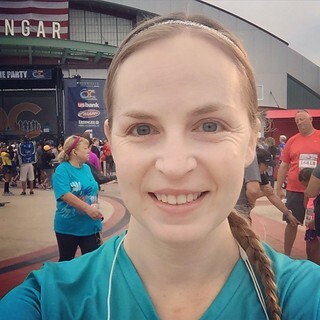 It was my reluctant backup plan after deciding to forgo the OC half marathon because my abbreviated training plan after my knee injury hadn’t really prepared me for it. Actually, by the time race day rolled around I probably could have handled 13.1 miles, but it was better than I didn’t try. (This was a huge benefit one week later when I ran the Tinkerbell 10K and half marathon, but that’s a story for another post.) One of my co-workers ran the half marathon wearing my bib so at least my registration didn’t go to waste. May 3rd was perfect running weather – cool, cloudy, and calm. May Gray has been kind to us so far this month. (Another thing I’ll write about in a later post.) This was in stark contrast to last year when we were at the tail end of an unseasonably hot week. 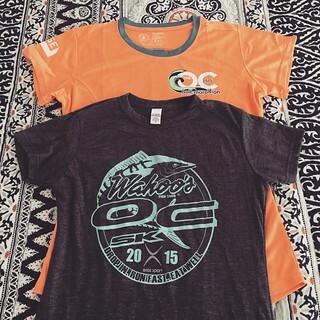 Actually, the 2014 Orange County 5K was my first 5K, and only my second race ever. I’d like to say I was faster this year, but that wouldn’t be true. After my injury back in January I was just happy to be running without any pain! I was slow, but fairly steady, and I crossed the finish line with a smile in my face. Maybe it was just a 5K, but I was still proud. My running regimen was finally back on track! P.S. My co-worker finished the OC half marathon in less than two hours! Crazy! Buying a car this time around was eerily similar to my experience in 2005. In ten years the cars have changed quite a bit (so many bells and whistles these days! ), but the way I went about purchasing one was about the same. First I went online and requested quotes from car dealers for two different Honda CR-V models (the EX-L and Touring). Then I was almost immediately inundated with emails and phone calls from local dealers who all wanted my business. As much as I liked the enthusiastic salesman at the dealer in Pasadena, it just wasn’t practical for me to go all the way back there to buy a car. And since they didn’t have one that I wanted in stock it saved me the trouble of seriously considering it. In both 2005 and 2015 the only dealer I had more than brief contact with was Honda World in Westminster. I’d like to say I went back there for my second CR-V because I had such a positive experience the first time, but that’s not it at all. Truthfully, buying cars there was pretty lousy both times, but their close proximity to Seal Beach was the biggest selling point. Back in 2005 an online sales representative at Honda World contacted me to say that they had the exact CR-V I wanted (model and color) in stock and gave me a great price quote via email. So I drove down there after work, but the salesman I had been in touch with wasn’t there that evening. The guy I did talk to informed me that they had already sold the CR-V I wanted, but they had the more expensive model available. Of course. I was reluctant, but I test drove it and went through the first stage of price negotiation, but in the end I decided that I just didn’t want that particular car so I walked away. The next day I got a call from the online sales representative saying that they actually did still have the original CR-V I wanted in stock, and he even scolded me for not talking to him at the dealer. He wasn’t even there! Sheesh. Based on this ridiculous behavior on everyone’s part I should have given them a piece of my mind and then gone elsewhere. But I was a little desperate so I told the sales rep that I would be there that afternoon to buy the car and that it had better be there. It was, so I drove home that day in my first CR-V.
Fast forward to 2015 and things weren’t much different. The day I requested online quotes I got a call from Honda World. It was one of the few phone calls I answered that day since I preferred to get the car negotiations done over email instead. Believe it or not, the same online sales representative that sold me my first CR-V was on the other end of the line. I told him exactly what I was looking for and he assured me that not only did Honda World not have one in stock, but that no other dealer in Southern California did either. First of all, I had email proof that other dealers did indeed have the car I was looking for. Second, isn’t a salesman supposed to make a sale? Luckily he couldn’t see me roll my eyes over the phone. I told him, “Thank you very much. I’ll let you know if I change my mind.” Not ten minutes later he called me back saying that he had found a CR-V for me. I think his strategy needs some work. However, it ultimately did make a sale. 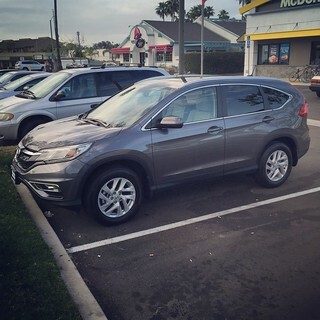 I needed a car, and Honda World was having one delivered from Ventura for me. It all worked out. So on April 24th I was the proud owner of a 2015 Honda CR-V. And so far I couldn’t be happier! I bought a new car on April 24th. This was almost a month after my 2005 Honda CR-V died completely, which I actually wrote about at the time (in an attempt to uphold my New Year’s Resolution #4). That poor little car went long before its time. But even after it was towed away on April 3rd (I donated it to charity for the tax write off) and I was left with just a rental, I was still reluctant to go car shopping. I just wasn’t excited about it. The thought of having to interact with potentially pushy salespeople, test driving unfamiliar cars, and eventually haggling about prices made me cringe. But then my friend Natalie offered to go with me. That was exactly the motivation (more like a kick in the pants) I needed to get out there and look for a new set of wheels. One Saturday, after driving that horrible rental for a couple of weeks, I drove up to Pasadena and met Natalie to go car shopping. The first place she took me was a Toyota dealer where I looked at both the RAV4 and the Highlander SUVs. Originally I was more interested in the Highlander, thinking it would be comparable in size to my old CR-V, but it was much larger than I expected. I ended up test driving both, but the RAV4 was more appealing. I liked it just fine, despite the lack of enthusiasm from the salesman who was helping us. I didn’t notice, but Natalie said he was dozing off in the backseat during the test drives. He certainly wasn’t wasting much effort trying to make a sale! For that reason I was happy to head to the Honda dealer next. This time we got a very earnest salesman who was keen to show us all of the fantastic features of the new CR-Vs. And they were pretty impressive. I was crazy about the touch screen navigation system, the backup and side view cameras, and all of the displays on the dashboards. And the test drive was a breeze because the latest CR-V handles very similarly to my old one. No surprises there. I loved the CR-V and it didn’t take long for me to decide that I definitely wanted to buy one. That particular dealer didn’t have the model I wanted so I was spared having to make a decision on the spot, but the majority of the work was done, thanks to Natalie. Without her help I probably would have put off car shopping even longer. But after she spent most of her day driving me to car dealers I was most of the way to getting a new mode of transportation. I am so grateful! So it seems I’ve taken a bit of a break from my blog, huh? I didn’t plan on it, but I’ve had a lot going on in my life since I last updated my webpage. Between the craziness at work stuff, rededicating myself to running, buying a car, and doing my best to enjoy what free time I can scrape together, I’ve been busy! Right now I’m sitting on my couch, watching Netflix, and recovering from the Tinkerbell Half Marathon Weekend. My legs are killing me and I’m exhausted. I have quite a few half thought out posts in work about what I’ve been up to over the last few weeks, but none of them are anywhere near ready to publish. This week promises to be busy too, but I’ll try to spend some time writing. Not sure when I’ll fine time, but I’ll try! I had the best of intentions when I made my New Year’s resolution #4 back in February to blog about events in a timely manner, but I’ve definitely fallen behind lately. That’s a side effect when you’ve got a lot going on, I guess. At any rate, in general, things are going pretty well with me. I’m just waiting for life to slow down a little so I can catch up!